Progressive Cyberstud Poker is a unique online progressive stud poker game developed by Microgaming, the leader in online casino systems. 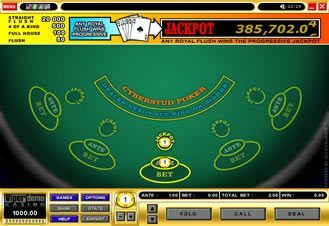 It is a Stud Poker game which allows a range of bet sizes from $2 to $101, and is connected to multiple casinos powered by Microgaming's advanced casino systems. New casinos are joining this system and continuously adding to the overall jackpot being offered to Progressive Cyberstud players. Progressive Cyberstud accumulates deposits from its players at all participating casinos and creates giant 6-digit jackpots.